This Peanut Butter Torte is decadent and absolutely mind-blowing good. Creamy perfection and easy to make. 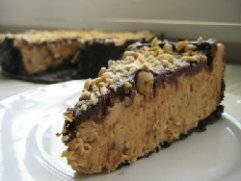 The crust is made from crushed Oreos; the filling is a cream cheese and peanut butter mousse; the crunch in the mousse are a mix of peanuts and chocolate. Okay, all together now: yum. The glaze is a bittersweet chocolate ganache, and it’s all topped off with a dusting of salted peanuts. Take this peanut butter torte to a school bake sale or serve as a celebratory supper with friends. PREHEAT oven to 350 degrees. Butter a 9 inch spring form pan and place it on a baking sheet lined with parchment paper or a silicone mat. Toss 1/2 cup of the chopped salted peanuts, sugar, espresso powder, cinnamon and chocolate in a bowl; set aside. Place the Oreo crumbs, melted butter and salt in a small bowl and mix with a fork until crumbs are just moistened. Press the mixture evenly over the bottom and up the sides 2 inches of the prepared pan. Freeze the crust for 10 minutes and then bake for 10 minutes. Transfer to a rack and let it cool completely before filling. Whip 2 cups of the heavy cream until it hold medium peaks. Beat in 1/4 cup of powdered sugar and whip until the cream holds medium-firm peaks. Scrape into a bowl and refrigerate until needed. Wipe out the mixing bowl and beat the cream cheese with the remaining 1 cup of powdered sugar on medium speed until the cream cheese is smooth. Add the peanut butter, 1/4 cup of the chopped peanuts and the milk. Fold in 1/4 of the whipped cream with a large rubber spatula, just to lighten the mousse. Now fold in the crunch peanut mixture, then gingerly fold in the remaining whipped cream. Scrape the mousse into the crust, mounding and smoothing the top. Refrigerate at least 4 hours, or overnight; cover with plastic wrap as soon as the mousse firms. TO FINISH THE PEANUT BUTTER TORTE, put the chopped chocolate in a heatproof bowl and set over a saucepan of simmering water. Leave the bowl over the water just until the chocolate softens and starts to melt, about 3 minutes; remove the bowl from the saucepan. Bring the remaining 1/2 cup heavy cream to a full boil. Pour the cream over the chocolate and with a rubber spatula, very gently stir together until the ganache is completely blended and glossy. Pour the ganache over the peanut butter torte, smoothing it with a metal icing spatula. Scatter the remaining 1/2 cup peanuts over the top and chill to set the topping; approximately 20 minutes. When the ganache is firm, remove the sides of the spring form pan; it’s easiest to use a hairdryer, and refrigerate until ready to serve. Recipe from my baking pal, Dorie Greenspan titled - Baking, From My Home to Yours.